Almost religious in design this icon reminds me of a compass or the astrolabe from the title sequence of Game of Thrones. There is something arcane and enigmatic about it, and it only takes a little imagination to see it carved into the stone doorway of a tomb or painted in stained glass above the altar of a church. This impression is amplified further by the strange, esoteric words placed at the apex of each line of the cross – Play/Work – Penalty/No Penalty – Prodigality/Parsimony. They sound like a code or a riddle, which if unlocked, opens a door or uncovers a forgotten secret. I’ve puzzled over these mysteries for years and frequently come back to reflect anew on what this strange icon might tell me about my own practice and my own understanding of Heathcote’s ideas. I’m convinced it encompasses some significant clues into how her methods operate in the classroom, in particular in the development and application of planning a sequence of activities. Truthfully, I’m still not sure I understand everything completely and I am convinced there is still much more to discover. Nevertheless, I feel I’m ready to share what I’ve learnt so far, and, rather like an explorer tentatively touching the symbols in an order he hopes will unlock a secret door, I offer them to you here. Unlike most of her diagrams, Heathcote gave this one a clear and unequivocal title – it’s a circle and it progresses. There are arrows to guide us in a clockwise direction and she helps us further by numbering each of the four quadrants so we know where to begin and where to finish. 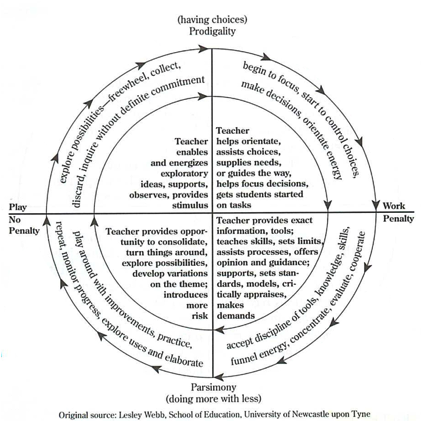 The circle, therefore, is a guide for the teacher to plan and mediate the learning she wants the students to develop, as Bolton continues: “each quarter forms part of a cyclic journey towards greater understanding, skill, and self-spectatorship.”(2) It can also be used as a tool for reflection and classroom observation. Bolton stresses there are no time expectations to this process and that on some occasions “the four quarters will be entered and left quite quickly over a short period of time. [While] on other occasions, each quarter will be lingered in because of the momentous or complex nature of the work.” This is an important contrast, since, much as a captain will refer to his compass on multiple occasions on a journey across the ocean, the teacher will come back to the guide to navigate her way through a single session, as well as, to plot her route through a longer-term project. We might call a sequence of activities through all four quadrants of the diagram a ‘cycle’. Cycles can vary in time depending on their degree of complexity and the readiness of the students. A cycle exploring an uncomplicated concept or simple idea might take only minutes, while a more involved and complicated series of concepts might involve a cycle that takes several hours. I think of a series of interlocking cycles as rings in a tree, nested inside one another, and radiating outwards, complementing and growing in length and complexity as they go. One cycle leads to another and then another, building in depth and sophistication as the context and the students’ learning develops. Thus, a cycle around one ring will lead to another and then another, so on and so forth, enhancing and developing the work as they go. 1. Play/no penalty and Prodigality. Play/no penalty – Heathcote and Bolton describe activities in quadrant 1 as “exploratory playing around’, by this they mean the students are given time to explore ideas and play with their thoughts. This is not a time for ‘messing around’ but (depending on the activity) there might be some talking, moving around, and possibly laughter. I remember when I first started using drama it was these times that worried me the most, they felt unstructured and a little out of my control, but gradually I learnt to relax and accept them as a necessary part of the process. What was happening, I realized, wasn’t that the students were out of control but that they were sharing ideas and playing with the content. All I needed to do was to wait and be patient. The important thing to remember is that at this point in the cycle the students can’t be wrong. This is what Heathcote means by ‘no penalty’. As the diagram explains, they are “exploring possibilities, freewheeling, collecting [ideas], discarding [unwanted ones], and inquiring without definite commitment”. The teacher’s role is to “enable and energize exploratory ideas, supporting, observing, and providing stimulus”. Often I find myself standing back to watch and give the students the time and space to talk and work things out for themselves. Sometimes they will need more structure, depending on the activity and the social health of the group, but it is not my role to direct them or tell them if they are right or wrong. Having choices/Prodigality – At this end of the circle the students have an abundance of choices, no paths are set, and no outcomes decided. By prodigality Heathcote is referring to the amount of options available to them. The teacher is not asking them to concentrate on anything in particular rather she is giving them the time and space to explore the content without limits. As they move into the second quadrant the focus will shift, becoming more refined and deliberate, but at this stage everything is on the table. Inquiry – the students are asked to look at a painting by William Bell Scott of Grace Darling and her father saving survivors from the wreck of the Forfarshire and to say what they notice. This is an open question, the students can’t be wrong. The teacher’s role is not to give them the ‘right’ answers, but to support them and encourage them to say more. During this activity there is some talk, some moments of silence, and times when the teacher needs to make suggestions to keep things moving forward. Writing – the students, operating as a team of park rangers, are asked by their client, the owner of the park, to write a report on the condition of animals from a recently condemned zoo. They are given a writing frame to help them and a list of useful words. They start by working in small groups, discussing options, making notes, and talking together about what their reports will contain. The teacher moves around the groups listening to the conversation, offering support, and making suggestions. Drama – the students, operating as a team of game designers, are asked by their client, a large video game company, to consider how the battle scene from Macbeth might be depicted as the opening scene to a new game. They are asked to create short video clips (no more than five seconds long) that can be spliced together to create a video montage telling the story and introducing players to some of the characters. The students divide themselves up into groups to work on the task. Initially there is some talk as the students discuss how they are going to work and then some movement. The teacher watches as the groups begin to depict the battle, she sees fighting with swords accompanied by shouts and laughter. Holding back, she gives them the time and space to work on their ideas, only stepping in if she sees things getting out of hand or to help those who seem stuck or disengaged. Patience is the key here. Work/penalty and Prodigality – Heathcote and Bolton describe activities in quadrant 2 as the time when “plans begin to emerge”, meaning the students start making decisions about where to focus their attention and begin to see the implications for what they doing. The time for playing is over. The teacher needs to step in and start helping the students to get organised, make decisions, and pay attention to the things that matter. She might need to ask the students to stop talking for the moment, concentrate, and think carefully. Laughing is no longer appropriate and she might need to remind some of students that people are working hard and need to be respected. I remember finding this level of control a bit paradoxical (aren’t the students the ones supposed to be making the decisions?) but at this point in the cycle control is exactly what’s needed. They need a leader, someone who can pull them together and focus on what matters. There are still lots of options (prodigality) but now there are implications, things that need to be looked at and examined. These are what Heathcote called ‘penalties’, meaning aspects of the inquiry, which, if misunderstood would carry a cost. So quality is what’s needed, a concentration on what’s important and what’s being communicated. Often the students’ need the teachers help to “orientate, assist, and make choices” and it is her role to “supply their needs, guide the way, help focus decisions, and get students started”. Inquiry – after showing the students the painting in quadrant 1 the teach asks what questions the students would like to ask, what they want to find out more about, who would they talk to in the painting if they had the chance. These are specific tasks designed to focus the students’ attention on the events of the painting and to concentrate their minds on the purpose of the inquiry. She asks the students to stop talking for a while and to write their questions down on post-it notes. She then collects them, reads them out, and sticks them to the board around the painting. Writing – the next stage for the park rangers in writing the reports is to take up the frames they’ve been given and make a first draft. The teacher might insist this phase of the writing is done in silence, giving the students the chance to concentrate without distractions. And as they write she could move around the classroom supporting those having trouble getting started or those who need a little extra help. Drama – to begin the next phase of the cycle the teacher chooses a group to display their film clip. She asks everyone else in the room to stop work and gather round. Their job, she explains, is to watch carefully and say what they see. They won’t be able to interact with the actors at this point, but they will need to look and try to make sense of what’s happening. The focus, she tells the actors, is on quality of expression, they’re not being asked to tell the whole story, just a brief clip, something for the audience to watch and make sense of, the higher the quality, the better the work. For the teacher, the key is to insist on things being done properly, she won’t tolerate laughter, and she won’t accept shabby pretence. Work/penalty and Parsimony – In quadrant 3 the students’ focus is narrowed still further by the teacher taking more control and providing exact information and precise instructions. Her aim is to concentrate their work into defined areas and to do, in Heathcote’s words, “more with less”. This is serious work, with a high demand. She is challenging them to think carefully, to refine what they do, and to start drawing meaning from the context. Her questioning needs to be carefully worded in order to probe, inquire, and delve deeper into the subject matter. Inquiry – the teacher now concentrates the students’ investigation of the painting onto specific questions and details in the picture. She provides them with the back story, telling them about Grace Darling and the night of the rescue, showing them newspaper clippings, and explaining how the rescue affected people at the time and made Darling a national hero. Her aim is to give the students the facts of the story and to answer, as best she can, the questions they have asked. There may, of course, be some that she can’t answer and these will provide a stimulus for further inquiry. Writing – having finished their first drafts the park rangers now revise their writing – checking spelling, grammar, punctuation, and meaning – before writing a final complete report to be given to the client. The teacher’s role is to provide feedback, give advice, and support them in this process. There is a focus on ‘getting things right’ – handwriting and presentation are important, as well as providing accurate and detailed information. Drama – continuing to work with the same group, the teacher now focuses the class on what the actors in the clip are telling those playing the game about the story of Macbeth. She asks them to notice their particular movements or actions, asking them to speculate on the meaning and purpose. The teacher’s questioning follows the pattern of Heathcote’s tool for deepening levels of dramatic engagement which takes the form of ‘Action – Motivation – Investment – Models – Values’(4). Her aim is to support the students in making meaning from the clip, to form ideas and theories about who these people are, why are they behaving in these ways, and what is important to them? (5) Always behind her questioning is the curriculum and what she wants the students to learn about the play. Play/No penalty and Parsimony – In quadrant 4 the students’ focus is kept narrow, but the emphasis is now switched to an open and more relaxed exploration of ideas and possible new directions. The teacher’s aim is to ask the students to reflect on what they have learnt and what the implications might be for the context. She gives them opportunities to talk, share their thoughts, and play with possibilities. There is no chance of getting things wrong, no penalty, just an open and honest exchange of views. This part of the cycle doesn’t always have to be a straightforward conversation, with everyone sitting in a circle and making contributions, but can be organised in all kinds of interesting ways, both in and outside the fiction. Inquiry – the teacher and students ‘take on’ the roles of different characters from the life of Grace Darling (such as her father, those who were rescued, her mother, and someone who read her story in the newspaper) in order to offer different points of view and possible answers to the students’ questions. The aim is to play with possibilities, not to give definitive answers. Writing – an adult takes on the role of the client in her office, reading the reports from the park rangers. The students (outside the fiction) listen to her thoughts. The aim is not to give them direct feedback (that can come later) but to give them the chance to hear her private thoughts and to discuss what they might mean for their work and its purpose. Drama – the actors from the group are brought out of the fiction and sat opposite the audience. The audience are then given the chance to ask questions and provide feedback. The aim is not to interrogate them or appraise their work, but to find out more and to explore what the actors had in mind and what they were trying to convey. The teacher is careful to protect those representing the actors from overt criticism, asking those representing the audience not to be judgemental, but to provide constructive feedback. To illustrate how the whole cycle works over a sequence of activities let’s look at a longer example based on the theme of the Romans. Objectives: To introduce the students to the theme, to stimulate an inquiry, ask questions, and generate reasons for researching the subject. 1. 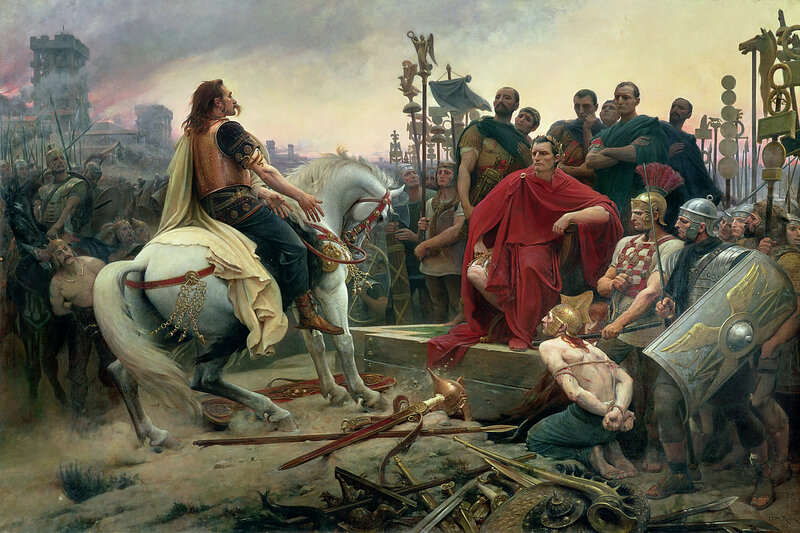 Imagine you’re starting a context with the Romans as the theme and to get the ball rolling you show the students a painting by the artist Lionel Royer called, Vercingetorix throws down his arms at the feet of Julius Caesar. This first session is a straightforward inquiry and you begin by asking the students what they notice. This is a quadrant 1 question – open ended, freewheeling, and ‘playful’. It involves a ten-minute conversation where the students make observations about their views of the painting. They can’t be wrong since they are only expressing what they can see – there is ‘no-penalty’. 2. Next you tell the students the story behind the painting, about the different characters, and you provide them with background information and knowledge about the cultures of the two groups of people, you then ask them to write down any questions they might have or things they would like to know more about. This is a quadrant 2 activity – focused, orientated, and guided by the teacher. 3. Following this you provide the students with a collection of resources – topic books, images, selected texts, and access to websites – and set them the task of finding out more and recording the results of their studies. This is a quadrant 3 activity – concentrated, informed, and supported. It is work and needs to be done well. The whole session might take less than an hour and has gone all the way round the cycle once. The students have played with ideas, developed questions they would like answered, accessed new knowledge, and applied what they have learnt into a new understanding. Of course, their levels of knowledge are still quite shallow and there is much more to find out, but you can feel confident they have become engaged in the subject and have developed enough background knowledge to start the next stage of the inquiry. Task: Create a proclamation from the Roman Governor of Britain, Gaius Suetonius Paulinus, after the defeat of the Boudicca rebellion, instructing the iceni people that revolt will not be tolerated, that all their weapons will be confiscated, and new laws introduced. Objectives: To introduce the students to the history of Boudicca and the Iceni revolt, to generate a reason for writing, and to explore the Romans attitude to conquered people. – In quadrant 1 the students gather in groups to collect ideas. – In quadrant 2 they work together to draft the proclamation. – In quadrant 3 they redraft and refine their final copy. – In quadrant 4 they review and discuss the implications, before moving on to the next task and another cycle. In this way, one session follows another, building and developing the students’ engagement with and understanding of the subject matter. Task: Create an Iceni settlement, where the proclamation will be read. Objectives: To create an Iceni settlement using drawings, for the students to research Iceni society and to use their developing knowledge to make a meaningful setting for the next stage of the narrative. Resources: Topic books, pictures, access to websites, paper, string, pens, pencils, and a list of buildings for an Iceni settlement. The students are set the task of creating the Iceni settlement where the proclamation will be read using the topic books and other resources to support their work. – In quadrant 1 the students work together in groups, looking at the resources, discussing possibilities and trying out ideas. – In quadrant 2 they bring the resources together and start creating the buildings that make up the settlement. – In quadrant 3 they bring their drawings together and discuss where the buildings will go and the implications for each decision. – In quadrant 4 they review their finished work, discussing how it was made, what they might change, and what might happen next. Task: Create the time when the proclamation arrived and everyone’s lives changed forever. Objectives: For the students to use their developing knowledge and understanding of the time to create an authentic event and to discuss its ramifications for those involved. Resources: A list of jobs done by people living in the settlement. The students are asked to imagine what it was like for those who first heard the proclamation. – In quadrant 1 there is a discussion about how the people in settlement knew the Romans were coming with the proclamation, was there a horn blown, or a shout from someone on the hill? – In quadrant 2 the students look at the list of jobs and discuss which jobs they are doing and where they are when the sound is made. They are asked to hold the position of people doing the work. – In quadrant 3 they are asked to voice their hopes and fears. The teacher facilitates this by telling the people as she moves around the space she will hear the thoughts of those close by, but as she moves away they will fall silent. And so the teacher carries on from one activity to the next, round and round the cycle, building a sequence of work as she goes, like rings on a tree, radiating outwards, developing the students’ knowledge, progressing their understanding, and enhancing their commitment to the subject. Like many of Heathcote’s heuristic tools, the Cycle of Progression is far from straightforward or easy to understand, yet hidden behind its arcane language and mysterious design is something genuinely useful and exceptionally productive. I hope you will agree. 3. By ‘tools’ I assume Heathcote is referring to the various methods, strategies, and disciplines of drama, inquiry, writing, etc. 4. Called, Levels of Commitment in Social/Cultural Development, Heathcote and Bolton (1995) p. 20. 5. This is called ‘invested action’ by Luke Abbott. In conversation.